I’m crumbling under the weight of the blog posts in my mind and on my camera just waiting to be uploaded. After a busy couple of weeks, I’m ready to complete my two-part post on our early April trip to Chicag0, Part 1 highlighting the delicious Handle Bar. Spending about 48 hours in a city where you know buckets of people, usually means, try as you might, you’re only going to see a handful of them. We did our best to create what Daniel referred to as “epic brunch” and, sure enough, had a fantastic crew come out to Treat on day 2. 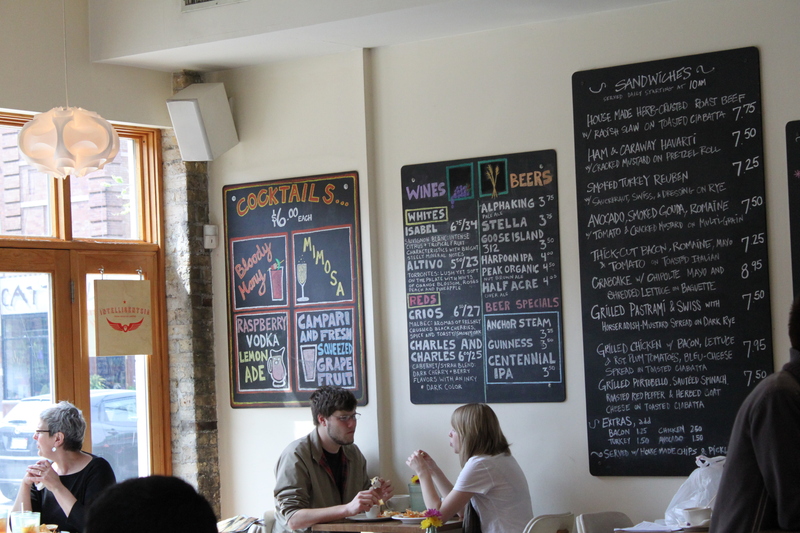 I’ve heard really good things about Treat, but never managed to go there during my time in Chicago. Better late than never. Holy crap. One of the best meals I’ve had in Chicago ever. EVER. I wanted everything and had a terrible time deciding what to get. Of course I started out with a good, strong cup of coffee. Then Megan blew our minds when she pulled two bottles of champagne out of her purse and asked her friend, owner Tamiz, for a carafe of o.j. So, back to wanting one of everything, I decided the tabled needed to have samosas for an appetizer. They were so good, I insisted on a second order, even though everyone said we had enough food coming. I’m pretty sure they were happy I did. These were by far THE best samosas I’ve ever had. They were so good. Basically everything everyone ordered was beautiful and, by all accounts, delicious. 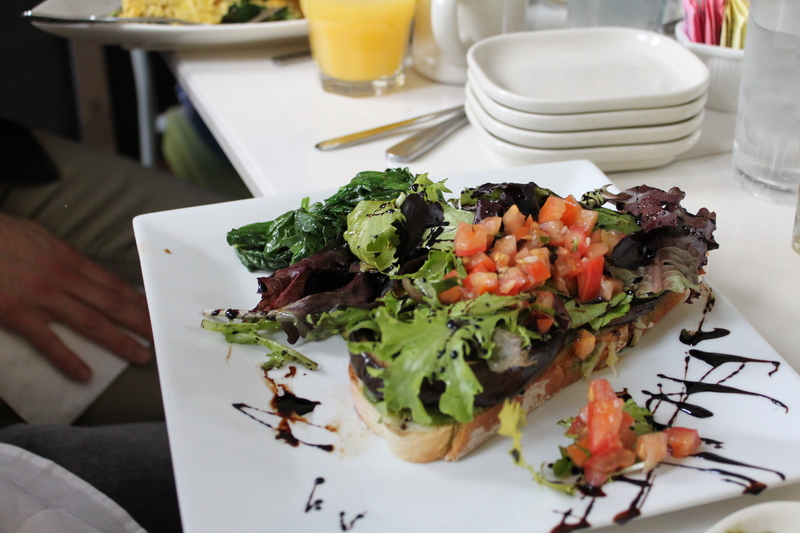 See what I mean — here’s Daniel’s open-faced veggie sandwich sans cheese. Many (or most) things on the menu have an Indian twist and it all sound incredible. 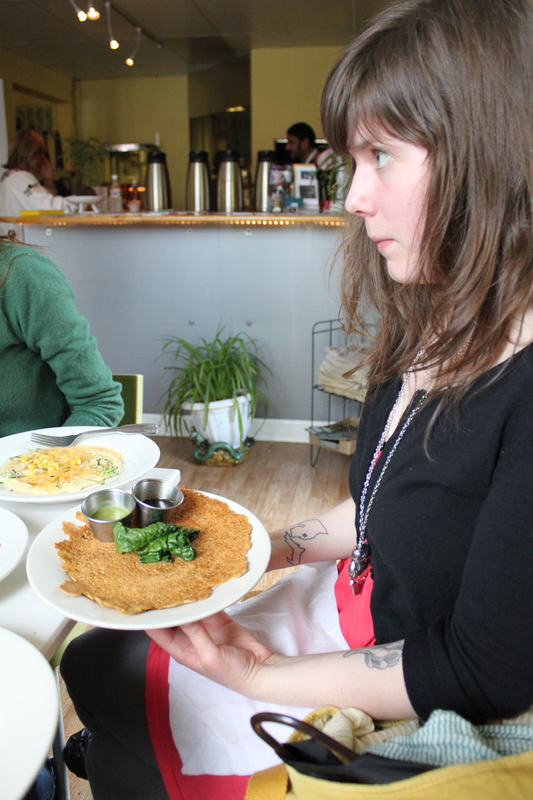 While the masala French toast, curried gnocchi and tomato korma rigatoni all sound like fine options, I decided to get one each of two different types of savory pancakes. 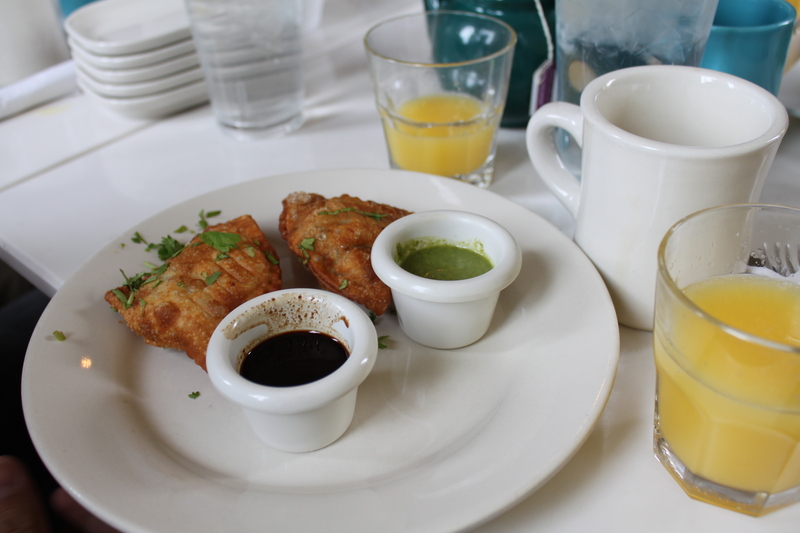 I got one pakora pancake, made from a chickpea batter with onions, wilted spinach, cilantro and tamarind chutney. It’s was very thin, with a mild flavor. My friend Colleen did the same thing I did and this was her favorite of the two we both tried. Here she is holding hers. Although I really liked the pakora pancake, I preferred the other pancake we each got. 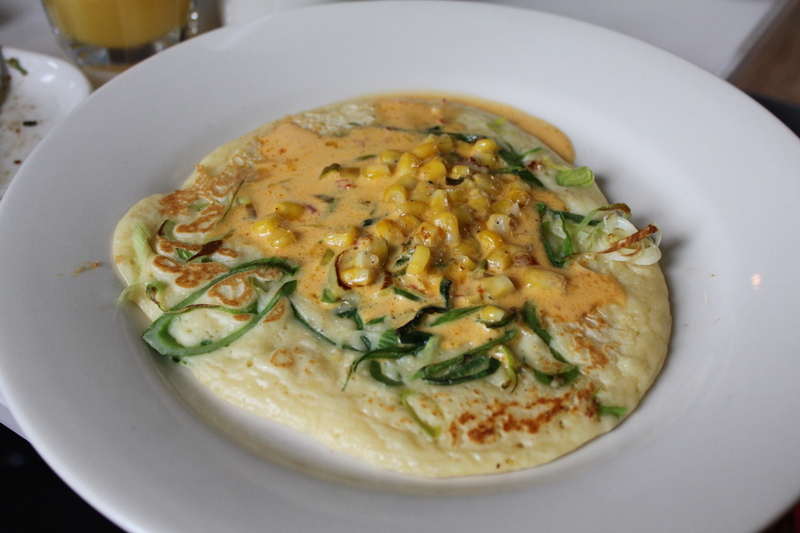 It was a thicker, savory pancake with leeks, roasted corn and a thin Hollandaise sauce. I wish I could eat one of these every day. Seriously one of the best meals in the history of the world. But it wasn’t over! 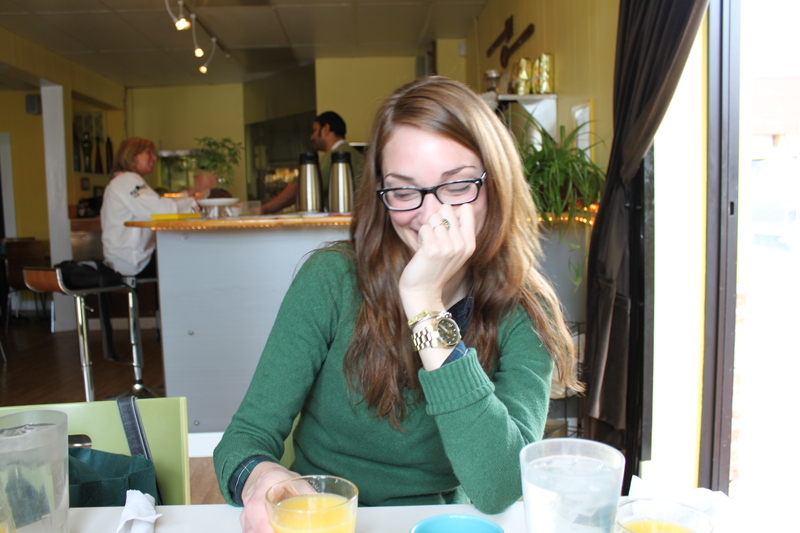 We all sat around, finishing off our mimosas and chatting. Stuffed to the gills, in the company of fantastic friends and ready to spend the afternoon shopping before slipping off to the Aragon Ballroom to see Thom Yorke, Flea and the rest of Atoms for Peace. Once again, Megan has one of the best ideas of all time and sits down to say we have two desserts on their way. 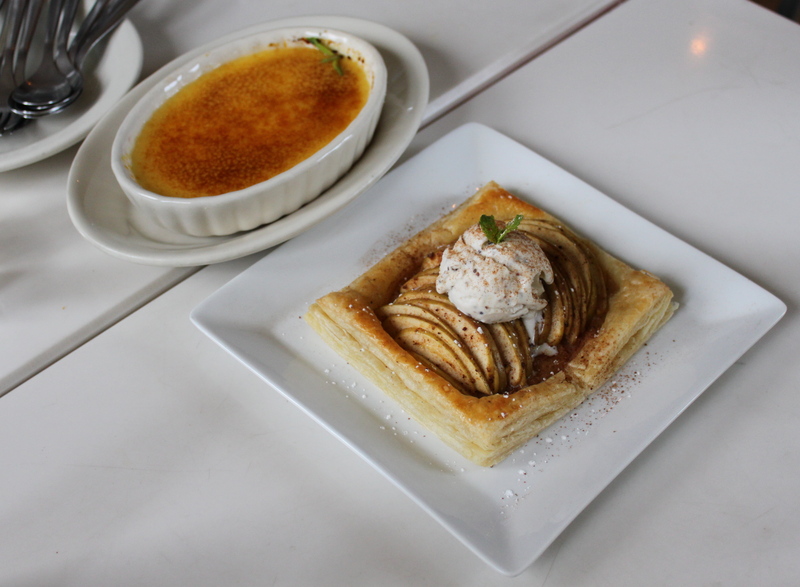 Mango creme brulee and an apple tart with black pepper ice cream. I love pepper. But ICE CREAM? Yes. Please and thank you. DELICIOUS. I can’t believe I never managed to go to Treat (or ever hear of it, though I lived 2 blocks north of it for a couple of months) and I can’t wait to go back — even though it will be a struggle not to order the same delicious things every time I go back! Practically next door to the beautiful Aragon Ballroom was Ethiopian restaurant Demera, so we waltzed in there. We got the vegetarian messob (where a bunch of food comes out and you all dive in with bread as your utensil) dinner for two, where you pick six different dishes. I don’t remember exactly what we got — a couple of dishes that were lentil- and chickpea-based, one that involved collard greens, maybe one with spinach. I panicked would not be nearly enough food for four people — but Leah was right. It was the perfect amount. We finished basically all of it, but left happy and full. Again, delicious. Before we took off Monday morning, we did a little Division Street shopping and stopped by Milk and Honey Cafe, where I’ve had many-a-good-breakfast. They have amazing granola and oatmeal and a really delicious casserole-style huevos rancheros during weekend brunch only. I didn’t love the breakfast burrito I got, but only because I’m not really feeling eggs these days. I asked for half the amount of eggs normally in it and kind of hoped there would be extra beans in their place, but it was still pretty egg-laden. 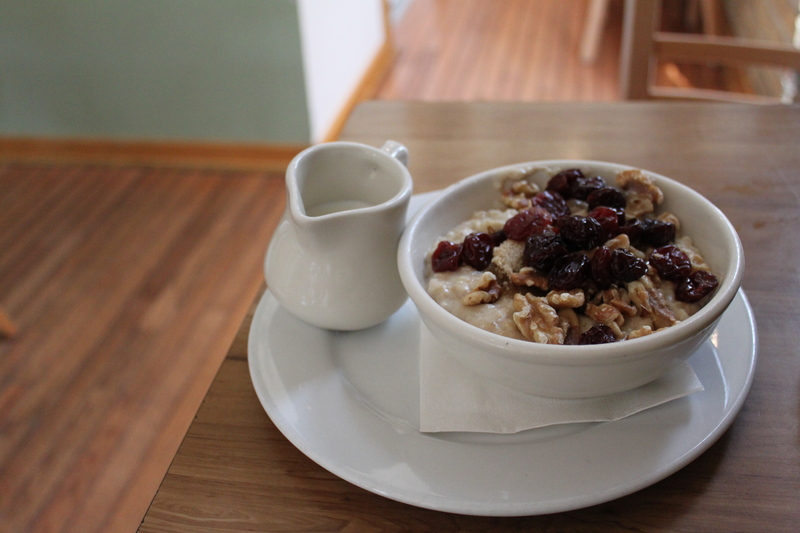 Daniel is somewhat of an oatmeal connoisseur and he loved his. Doesn’t it look delicious? And a trip to Chicago wouldn’t be complete (at least for Daniel anyway) without stopping by Sultan’s on North Avenue for the best-falafel-of-all-time (though Anita’s Kitchen right here in Ferndale is catching up, I think). They’ve apparently doubled in size from their buffet and cafeteria-style one-room restaurant since the last time I was in there. I ran in and picked up two sandwiches, then we hit the highway. They hit the spot a few hours later when we got hungry again on our way home. This may have been the best trip to Chicago yet in terms of food, and that’s without going to some of my favorite restaurants. It’s so great to discover new things in a city I still love so much, and made me want to explore Detroit restaurants even more after I got home! Entry filed under: Chicago, Restaurants, Travel, Uncategorized.